IN THIS ISSUE: Flash flashback within a Flash Flashback flashback. COVER by Carmine Infantino and Klaus Janson. 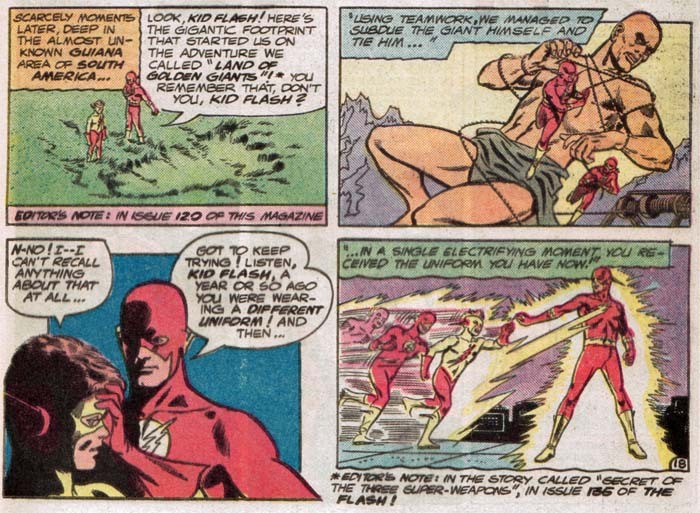 Prior to showing up on the last page of issue #343, Kid Flash had not appeared in Flash since #325, where he appeared in the main feature and his own backup story. PG 1: Kid Flash and Flash were last together in Tales of the Teen Titans #49. 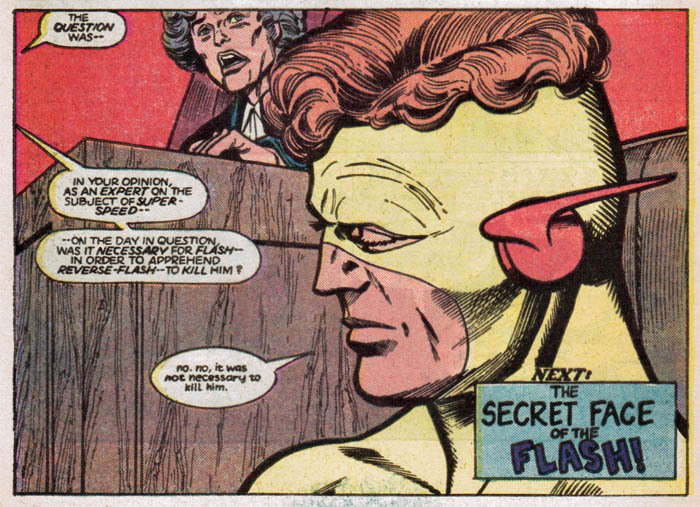 In that issue, Wally mentions that he’s waiting to be called to testify but he expects to be questioned as an eyewitness and not a super-speed expert. Kid Flash retired in New Teen Titans #39 (Feb. 1984). This issue features partial, framed reprints of stories from Flash #110 (Dec./Jan. 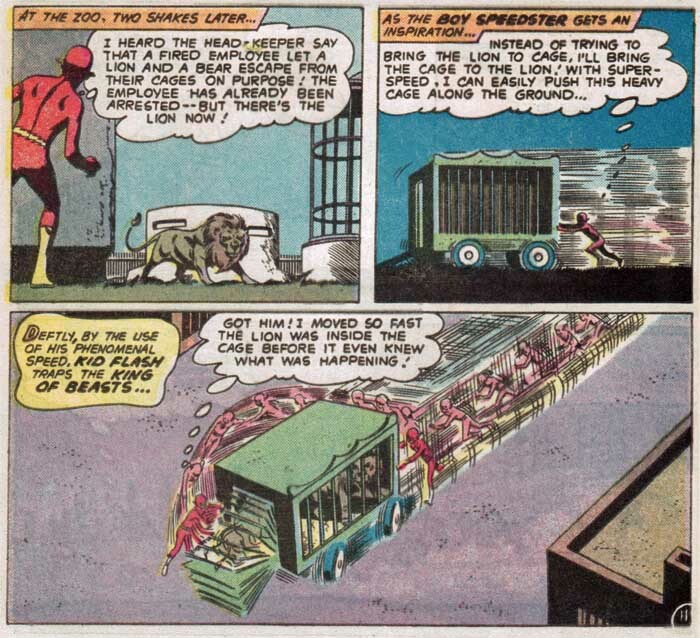 1959, “Meet Kid Flash”) and Flash #149 (Dec. 1964, “The Flash’s Sensational Risk”). 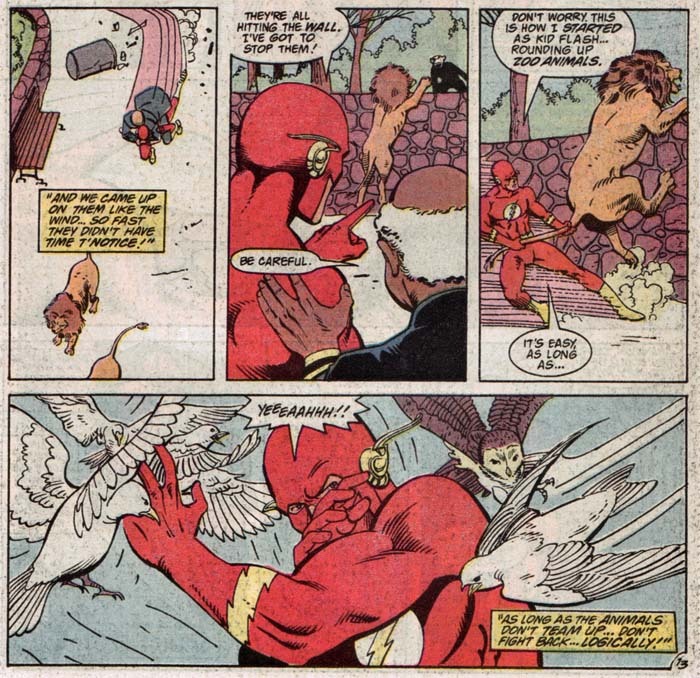 Both stories, own their own and via internal flashbacks, show key points in Kid Flash history. 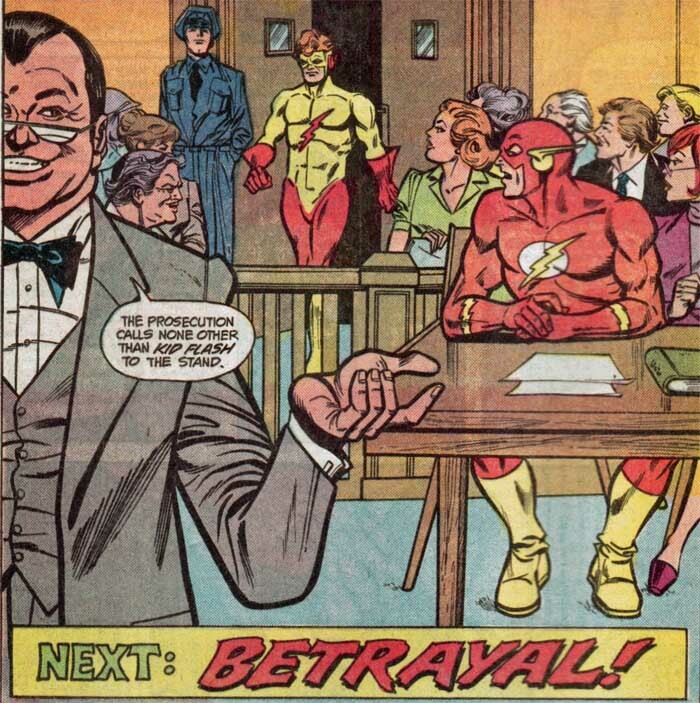 Each also has a tie-in to the fate of Flash’s secret identity during the Trial. PG 14: This was the only appearance of the planet Ikora and the K-10 Gang. PG 18: This story was probably chosen for reprint/flashback because it also flashes back internally to Flash #120 and #135. The original art for #120, page 25 can be seen here, via Comic Art Fans. This is the only original art I could find related to #344 and its flashbacks. Even though Joe Giella inks both reprints here, Infantino’s figures are a little more muscular in issue #149, an aspect weighted further by Frank McLaughlin’s heavy black inks in the 1985 framing sequence. Check out this “History of Guyana” for more on the locale seen in panel two. PG 20: The reveal sequence here is another reminder of Barry’s choices and secrets in the Trial story. Barry was always secretive. 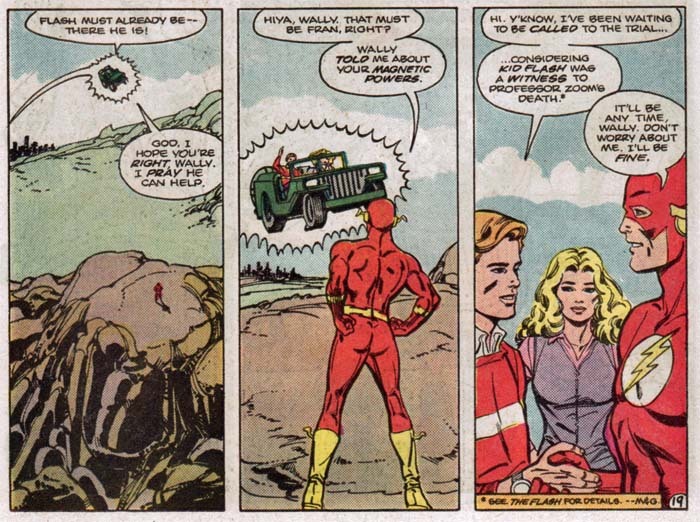 He kept his Flash adventures a secret from his wife (though she knew ahead of time due to Barry’s sleep-talking) and didn’t reveal he was Barry Allen to Kid Flash until the latter’s seventh appearance in #120. PG 23: On the back cover of the original, it says in a preview for this issue, “Kid Flash testifies against his mentor!”. That applies to two speech bubbles in the entirety of this issue. The real testimony will happen next issue. 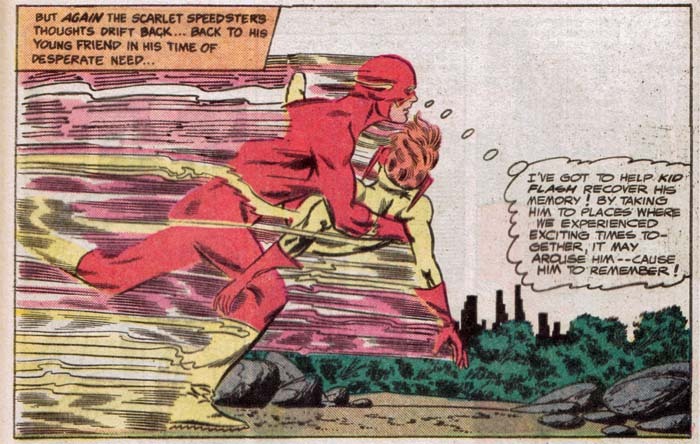 This entry was posted in Annotations and tagged Barry Allen, Carmine Infantino, Cary Bates, frank mclaughlin, Joe Giella, John Broome, Kid Flash, new teen titans, the trial of the flash, Wally West on July 12, 2014 by Greg Elias.